Drumming shakes the earth & moves the soul and you can feel it at Hear, Here! Batimbo United Burundi Drummers moved our building & all that were in it. PORTLAND, Maine — It is not often that what we produce in the 207 studio is felt in the newsroom one flight up. But when Batimbo United Burundi Drummers performed for us the newsroom felt the drumming in the floor. The performance combines powerful, synchronized drumming with dancing and traditional song. The history of the Batimbo dates back into the mid 20th century. Through Batimbo United it represents Burundi culture here in Maine & throughout America. If you are interested in seeing Batimbo United Burundi Drummers they are part of a larger performance, Hear Here. 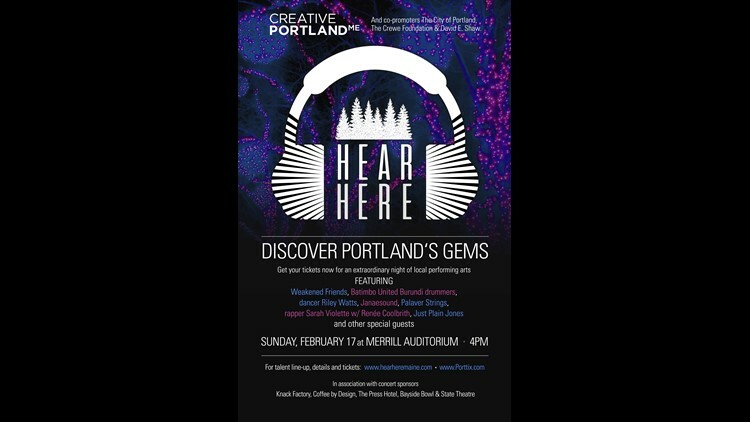 An inaugural concert featuring a number of performing arts on the stage at Merrill Auditorium in Portland on Sunday, February 17, at 4:00 pm. Hear Here is fun for the whole family and brings music and performance to the public at a time everyone can see it. Enjoy the rhythm of Burundi from Batimbo United as well as many other acts.